Dr. Terri Aldred is Carrier from the Tl’Azt’En Nation whose traditional territory is North of Fort St. James near the geographical centre of British Columbia. Tl’Azt’En are a matriarchal people and therefore she follows her great-grandmother Cecilia Prince’s line and is from the Lusilyoo (frog) clan. Terri was born in Prince George and ultimately graduated form high school there, however, she spent over 6 years in between living on the Tachet Reserve located on Babine Lake. So, it is not surprise that she has a deep passion for addressing health concerns in northern isolated communities. 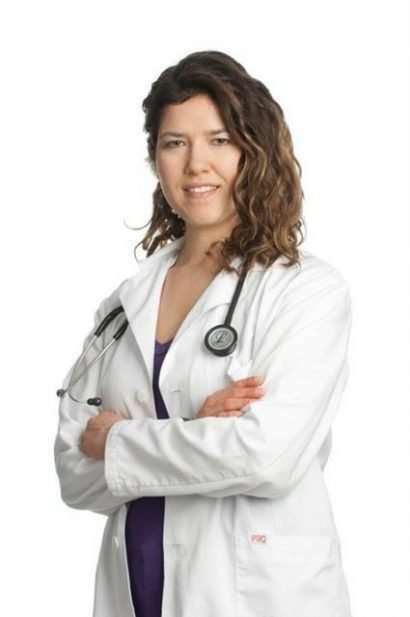 Dr. Aldred went to medical school with this goal in mind and graduated in 2011 from the University of Alberta with a Bachelor of Science degree in Health Science and a Doctor of Medicine degree. Terri then continued on to join the Aboriginal Family Practice Residency in Victoria, BC which she completed in June 2013. During her studies, Terri was heavily involved in both Aboriginal Health initiatives as well as mentorship and admission programs. This past summer she started the road to living to her dream of bringing culturally appropriate health care to both the inner city population in Prince George and in First Nation’s communities in the area. She has grown up in both of these populations and this has shaped her into the person she is today; it is a privilege and honour to give back. Terri is a huge supporter of Arts in Medicine. She was fortunate that the University of Alberta Health Science department had quite an extensive program that worked tirelessly to incorporate the arts into medical training. Terri wants to express that she feelsvery honored to be involved in this initiative and can’t wait to see all the wonderful projects that will stem from it.